Mac and cheese is not something we make all that often around here, but maybe it should be. And no, we’re not talking the glow-in-the-dark Kraft stuff (of which I shamefully consumed a lot in college), but honest-to-goodness, from scratch macaroni and cheese. It’s a classic comfort food, easy to whip up, and is adaptable to any situation. Want it spicy? Toss in some chorizo and diced peppers. Healthier? Add small chunks of broccoli and cauliflower (kids won’t even notice). Something fancy? How about some lobster meat and a little goat cheese? Today, since we’re smack dab in the middle of fall (though Nature sometimes gets confused), we’re going to make our mac ‘n cheese base, add in some sage, butternut squash, and bacon, then pop the entire thing in the oven to bake to make it a little more sophisticated. Butternut squash and sage is a classic fall flavor, and bacon, well… bacon fits with anything, in any season. 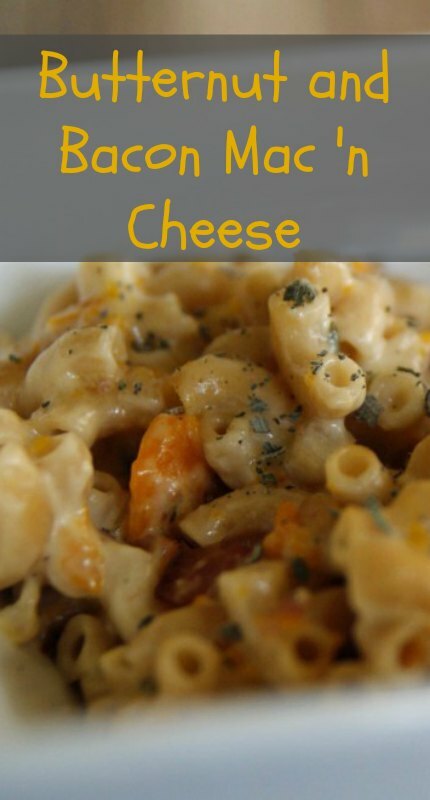 This is a hit with everyone – creamy, cheesy, savory, and just a little sweet. 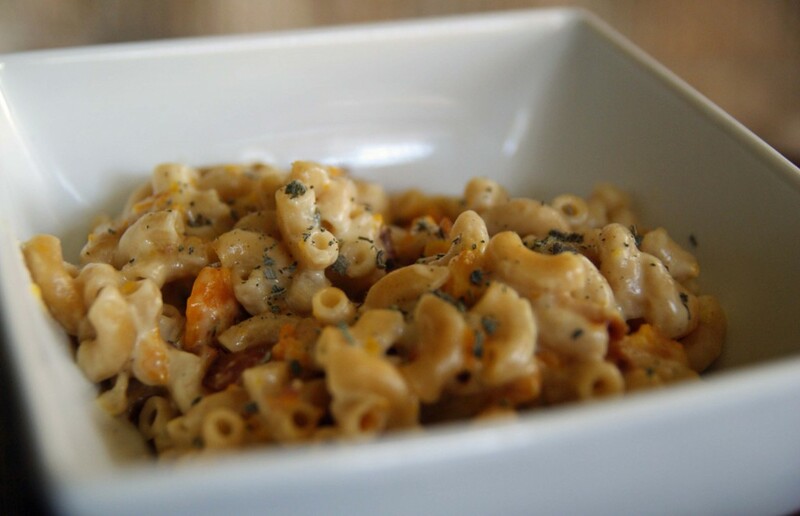 Your taste buds will thank you for this butternut bacon mac and cheese! Heat a large pot of water to boiling for the pasta. In a large skillet, fry the bacon until crispy-soft (if you like yours crunchy, go for it). Remove the bacon. If you save bacon grease, now's the time to spoon some off. Add the squash, onion, and garlic to the skillet, cooking over medium heat until lightly browned and soft. The squash should start to fall apart a little - you can mash it up more, or leave it on the chunky side. Preheat the oven to 400 F. Add the pasta to the boiling water and cook until al dente (follow package instructions, or test every minute starting at about five minutes). Drain when done. To make the sauce, melt the butter in a saucepan over medium heat. When melted, add the flour and cook for another minute.Slowly whisk in the milk, stirring CONSTANTLY to avoid chunks, and bring to a simmer. Some of my early sauces ended up pretty chunky, but once you get the hang of it (and really, it's not at all difficult), you can create a basic white sauce for anything! Once the sauce has reached a simmer, add the cheese, a little at a time, stirring until the cheese has melted and the sauce is smooth. Add the herbs, salt, and pepper. Add the squash and bacon mixture to the sauce, stirring to combine. Add the pasta to the sauce and mix it all up to make sure everything's well incorporated. Dump the whole shebang into a greased casserole dish, and sprinkle the breadcrumbs on top. Bake for about 15 minutes, or until golden and bubbly. 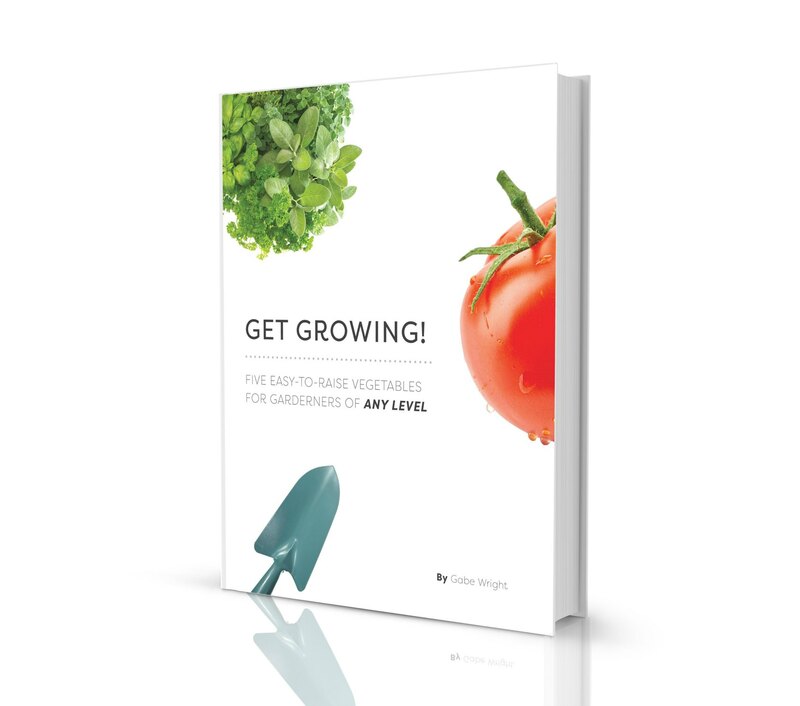 *Don't have breadcrumbs? In a food processor, beat up the stale end of yesterday's loaf of bread. Voila.